Help to keep the country's oldest law school thriving. We hope you will reflect on your time at the Law School as one of the most valuable experiences of your life. As a top tier law school, William & Mary attracts exceptional students and world-class scholars who are also superb teachers. Through its commitment to educating the citizen-lawyer, the Law School enables students to graduate with skills and experiential knowledge essential to succeed in both the public and private sectors. 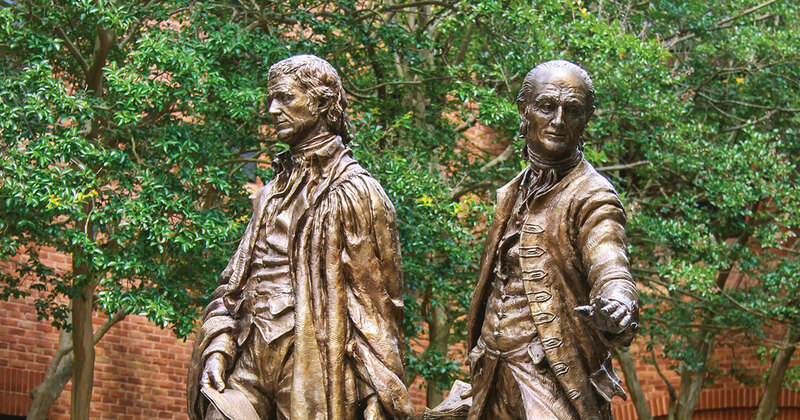 Since it was established as the nation’s first law school in 1779, William & Mary has been dedicated to preparing students to not only become skilled legal practitioners, but also emerge as citizens and leaders in their communities, states and nation — upholding the citizen-lawyer ideal of William & Mary alumnus Thomas Jefferson. The financial support of alumni, parents and the extended community provides a solid foundation for the continued excellence of America’s oldest Law School. Private gifts, whether to the Annual Fund or to an endowment, provide scholarships to deserving students as well as funding for research centers, clinical programs, and student organizations. Support for the Law School is an investment in the future of legal education and in the value of a degree from Marshall-Wythe. Every gift makes a difference.